When a team shoots 50 per cent from three-point range, out-rebounds its opponent by 12, and has two players combine to score nearly as many points as the other team, they’re probably not going to have much trouble getting the win. 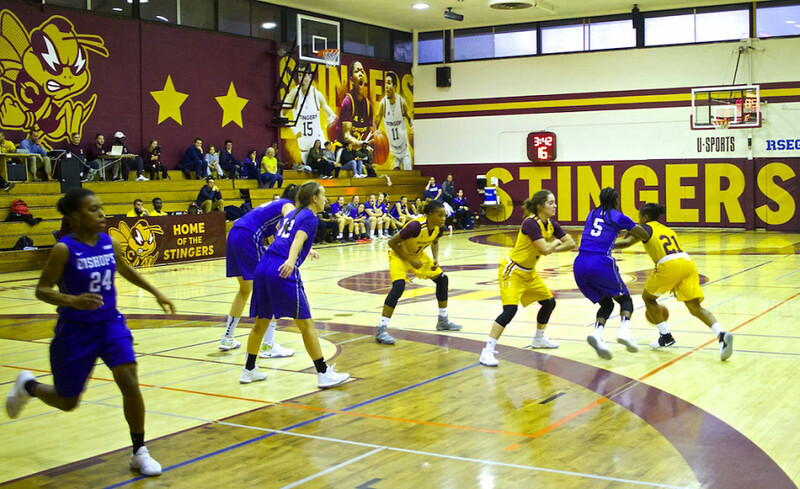 That was the kind of night the Stingers women’s basketball team had in their season opening game against the Bishop’s University Gaiters at the Concordia Gym on Thursday. D’Anjou Drouin scored a game-high 30 points along with five rebounds and three assists. Fellow guard Caroline Task, meanwhile, showed no signs of a sophomore slump, scoring 26 points along with four steals, three assists and two rebounds in the first regular season game since last season where she was named the Réseau du sport étudiant du Quebec’s rookie of the year. While the two guards did combine for 56 points in the game, Gittens is pleased with the contributions she got from her entire roster. Though she thought she could have gotten more out of everyone, she was quick to point out forward Ashley Moss, who didn’t score, but led the game with 12 rebounds and four blocks. Gittens sees some areas that need improvement, despite the blowout win. Specifically, she’d like to see the team’s pick-and-roll become more effective. Things like that, as well as other details like defensive communication and closing out on perimeter shooters are what kept Gittens from being more than just “pleased” with her team’s performance. Task and D’Anjou Drouin agreed, but were happy with how well their first game went and were hopeful that those things would be ironed out over the long season. The Stingers won’t have to wait long to get back in action. They travel to Quebec City on Sunday to face the Université Laval Rouge et Or, who won the RSEQ regular season title a year ago.